It’s Virtual Vacation Time at Vintage Home! You work hard all year, so why wait for a week or two in the summer to take a vacation? At Vintage Home, we think your home should be a retreat – one you can enjoy every day. So this week take a trip to our little place, and let us show you how to turn your home into your favorite getaway. Enjoy breakfast in bed in your room by the shore (real or imagined). 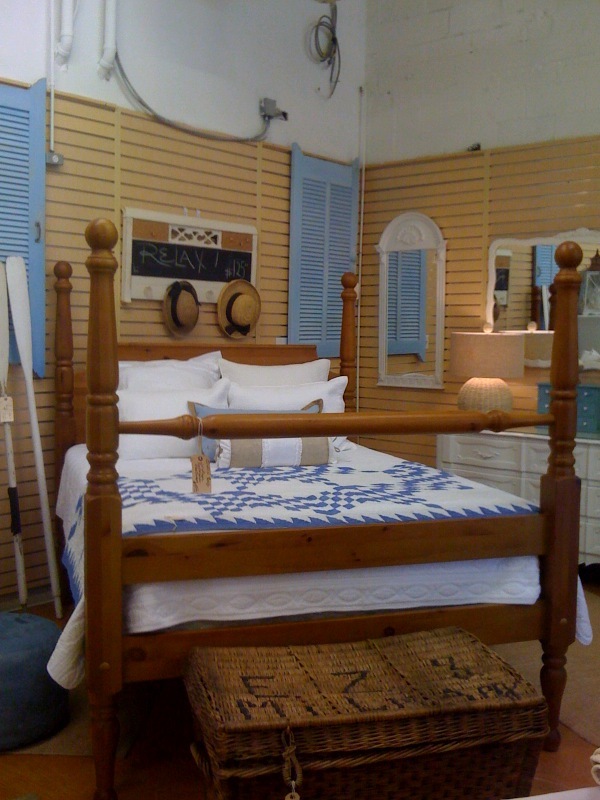 This four-poster queen size bed in natural pine is a great canvas for your beach-inspired master suite. Complete the look with this “Beach House Blue” cupboard made of reclaimed wood. You’ll also want to check out our great new selection of bedding, mirrors, benches and console tables! Want to spend cool summer nights in in your virtual cabin in the woods? Let these genuine leather armchairs be the focal point for an at-home man cave. Pair them with cool ottomans and sophisticated bookcases, and start your vacation right now! How about a Palm Beach retro vibe? Head for that tropical feeling in this pink-upholstered vintage armchair with the perfect pop of color in your private oasis. Then choose some elegant lighting and vintage bedside tables to complete the look! Dine at the best restaurants year-round… You don’t need reservations for a seat at this hand-painted vintage pedestal table. Find a great selection of tables–and oh the chairs! We’ve got everything from zebra- and leather-upholstered to acrylic ghost chairs. So before you check out Travelocity or Expedia, consider making your home the vacation spot you always dream about. At Vintage Home, we’re here to help! We’re open seven days a week: Mon-Sat from 10 a.m. to 5 p.m. and Sun from 12 to 4 p.m. Come by soon–exciting new arrivals every day!